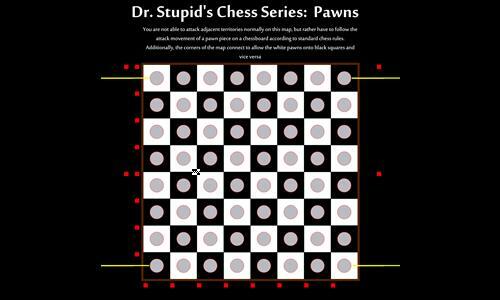 This is a standard chess board where your attacks can only follow the movement patterns of the pawn piece. Have Fun! Review by Nathan on 4/4/2014. A lot of fun, once you get the hang of it. I like the distributions, but unfortunately they are not scenarios. As a result, you can't really get a white vs. black game. lol. thanks for the review. I just saw your new knight's board. I've got one like it currently in testing similar to this board. I'm pretty new to map making and haven't played with scenarios yet, but I might give it a go on your recommendation. Review by Andalorium on 9/10/2016. The only single reason that the corners meet is to facilitate a white square to black square movement. Otherwise the game could potentially be unwinnable.